Unusual Venues for Catered Events – Go Beyond the Old Standbys to Make Your Affair a Standout! While banquet centers, country clubs, event halls and hotel facilities are tried-and-true choices for catered events, many couples and event planners are now looking for something different. Art museums, city museums, natural history museums and even children’s museums often have spaces to rent on off days or after-hours. Consider, too, any specialty museums in your area. If you stage your wedding reception, corporate meeting or other catered event at such a location, you’ll benefit from some scenic backdrops. 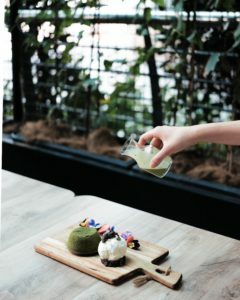 What’s more, the staff may delight in offering guided tours or opening certain exhibits for your guests to explore during cocktail hour. 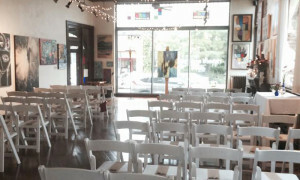 Want to take your vows on stage? Or, perhaps focus attention on a new product launch? Theaters and outdoor amphitheaters can be a great choice for your catered wedding or catered corporate event. Many hold liquor licenses and are already set up to serve adult beverages. But, note that amphitheaters are popular in the summer. So, if you’re looking to stage your catered event outdoors, think spring, early summer or the fall. If you’ve spotted an attractive park, lakeshore or nature area for an upcoming wedding or other special event, do a little homework. It’s likely you’ll need to apply for a permit ahead of time. And, many will have restrictions in terms of bringing in tents, entertainment or food. That said, work with your special event caterer or event planner. One solution? 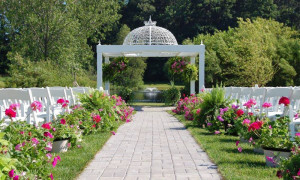 Hold a wedding ceremony at the park and host the reception at a facility nearby. With their classic architecture and beautiful grounds, historic libraries and homes can make for stunning wedding venues. They are also excellent sites for company parties, anniversary celebrations, reunions and other catered affairs. When in season, it’s hard to imagine a more beautiful choice for a catered wedding reception or other catered event than a botanical garden, conservatory or horticulture center. In addition to colorful blooms, many such event venues also offer tree-lined paths, manicured flower beds and even scenic fountains. Many public aquariums and city zoos offer their spaces for catered special events. You and your guests will enjoy an unusual and memorable venue for your party, celebration or wedding reception. And think of the creative photo opportunities! Make the most of the spring, summer or fall by holding your wedding or other catered event at a venue with beautiful surroundings. Many feature large patios, rustic barns or other facilities dedicated to wedding ceremonies, receptions and other special catered events. And, don’t overlook these locations for winter affairs. Frosted with a fresh coating of snow, a farm, vineyard or orchard can make for a lovely setting! 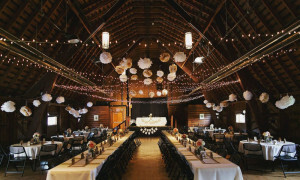 These days, converted buildings such as former factories, warehouses and even airplane hangars are being rented out for parties, wedding receptions and other catered special events. Think of them as “blank canvases” that can be transformed to fit almost any theme. Of course, if the space doesn’t hold regular events, an event planner or special event caterer can be a big help. They’ll help you navigate the more challenging aspects like party rentals and liquor licenses. Work with your event caterer or planner if considering an unusual location for your upcoming wedding, party or other catered event. Familiar with the area, they’re likely to have some good suggestions for you. And, even if you had a “brainstorm” on your own, it’s likely you’ll benefit from their expertise in making your idea a success!